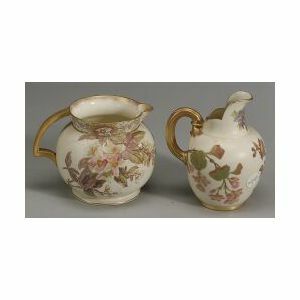 Two English Porcelain Handpainted and Parcel Gilt Pitchers, second half 19th century, comprising a Doulton & Co. round jug with angular gilt handle, painted with flowering branches, ht. 5, and a Royal Worcester ovoid jug, with reeded gilt ear handle, painted with lilies, chrysanthemums and apple blossoms, ht. 6 in.